I have a MacBook Pro Retina mid 2014 running OSX Yosemite (10.10.1). I have connected an external 4k monitor (Samsung U28D590D), but I'm struggling to set the correct resolution. 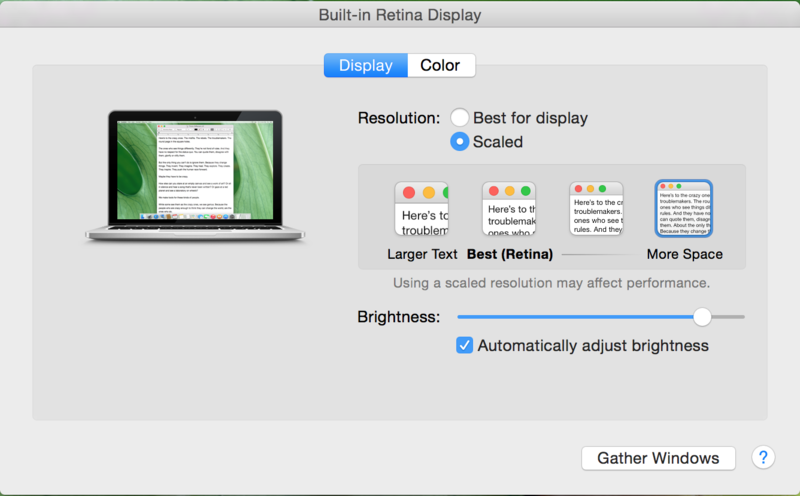 When I open "display" I don't get the same scaling-options on the 4k monitor as I do on the Mac internal display. When I use 1920x1080 the icons and text is very crisp (hidpi), but everything is to large. The 3840x2160 resolutions is pretty crisp, but everything is way to small. The 3200x1800 (low resolution) is not crisp at all. What I want is to use the "More Space" option as I do on my Mac display. Is there any way to achieve this? The display is connected through displayport. @jorgen.ringen, I am facing the same issue with a 13" 3Ghz Macbook Pro 11,1 (mid-2014). The reviewer in 9to5mac from the link you posted states that the HDMI input ports will only do 4k at 30hz, so the only solution (as he also states) is to purchase a miniDisplayPort to DisplayPort 1.2 adapter or cable. I went for the cable and am currently awaiting its delivery. I played with SwitchResX lots. Several threads on the internets suggest overriding the EDID in an attempt to fix the Television=yes in System Report problem, using Picture in Picture mode and running the display off of two cables. Neither of which is very satisfying to me, as its either a) PIP is not for every day use or b) requires plugging two cables, making it further more difficult to mount my machine on a desk and take it off. The DisplayPort cable will hopefully do the trick when it arrives. Meanwhile, I noticed there is some kind of firmware update on the product page of the monitor. It requires a Windows machine, so I have not yet tried it. I can't find a way to see the current firmware version in the display menu either, but Samsung state that its a "compatibility improvement update" or some such. There is no changelog as to what changed since the previous version, or any explanation as to how that potential update might occur. To my knowledge, HDMI 1.4 supports Ethernet and maybe thats how the update takes place. If you have a Windows machine around, give it a try and report back please. P.S. Unfortunately, the stupid SE comment policy will not allow me to post this as a comment. Whatevs. Do you get different options if you drop the refresh rate down to 30 or lower? I'm guessing you don't get the same options simply because it isn't a retina screen; instead you get the resolutions your card/display can negotiate between them. From Everymac This model supports a simultaneous maximum resolution up to 2560x1600 on two external displays via Thunderbolt. Alternately, it can support a single display up to 2560x1600 via Thunderbolt and a single 1080p display at up to 60 Hz, 3840x2160 at 30 Hz, or 4096x2160 at 24 Hz via HDMI. I had the same problem. Macbook pro and Samsung U28E590 monitor just on 30hz. I had ensured that I had USB-C to HDMI is 4k@60Hz. Then then only other suspicious part was a cable. As you know cables came bundled together (for packaging purposes), then I tried to unwind all the curved parts of the cable (to make it more straight) as with this also cable interferences comes down (HDMI barely works on 4K@60Hz) as to make sure that interferences are minimised. Then as miracle start working monitor on 60Hz. So try to "flatten" the curved cable. 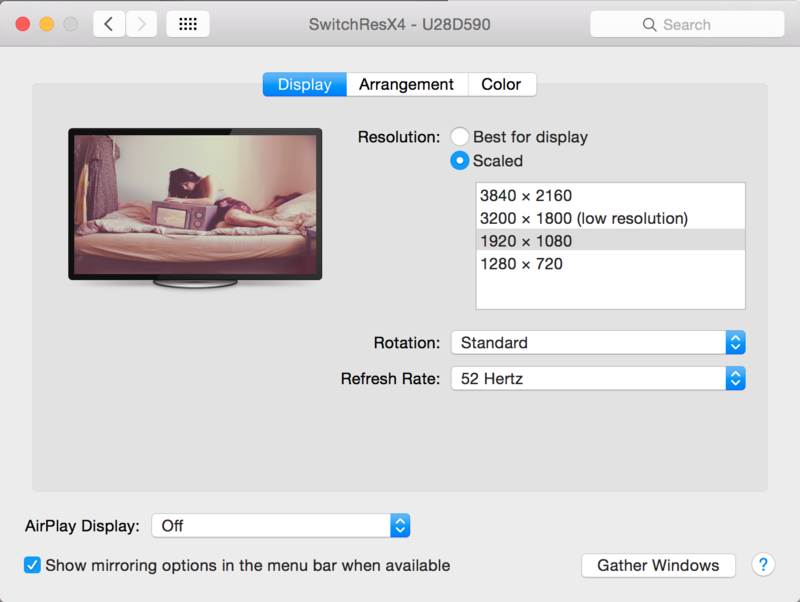 What are the effective scaling modes on OSX with a 4K display? Is an effective real estate of 2560x1440 possible? How do I get the scaling options for “larger text - more space” for an external display?